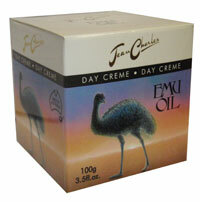 Emu Oil Day Creme is a unique Emu Oil based creme that gives you lasting moisture all day. Leaves the skin dewy soft and ready for the application of makeup. It seals in the skins natural moisture and improves the skins natural ability to retain its own moisture. Just love this creme. I have been using it for a few years now. Glad that I found a website where I can buy it and get it send to Spain where I live. I love this product. Received it as a present a few years ago and found it amazing. Would strongly recommend it to anyone.